Load-shedding may have kept parts of South Africa in the dark, but the Tertiary School in Business Administration (TSiBA) Eden campus in Karatara, near Knysna, is basking in the glow of success. TSiBA was awarded first prize in the Eskom Eta Awards Community Category with their project on ‘Institutionalising energy savings’. Never have awards like this been more relevant in South Africa – with high electricity costs, insufficient power capacity and leveraging off our abundant sunshine. TSiBA Eden’s environmentally savvy campus operations save the environment and relieve pressure on the power grid, but they help save electricity costs for this unique not-for-profit tertiary education institution. 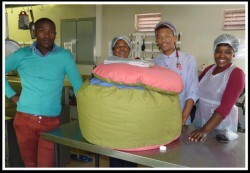 TSiBA Eden practices a variety of sustainable energy initiatives in their Laundry and Kitchen Departments, as well as income-generating Vegetable Garden. Almost all techniques are low tech and easily replicable in urban or rural homes. Systems include solar geysers and a solar oven, donated by Rotary, which are used extensively for the showers and kitchens. Simple black pipes installed on the roof heat water for things like washing dishes. The kitchens use insulation cooking bags and clay ovens which make use of compressed recycled paper ball coals – both are produced by the students on campus. TSiBA Eden is still accepting online scholarship applications for 2015 on www.tsiba.org.za. For more information contact Genevieve on (044) 356 27 89 extension 19, or email [email protected].